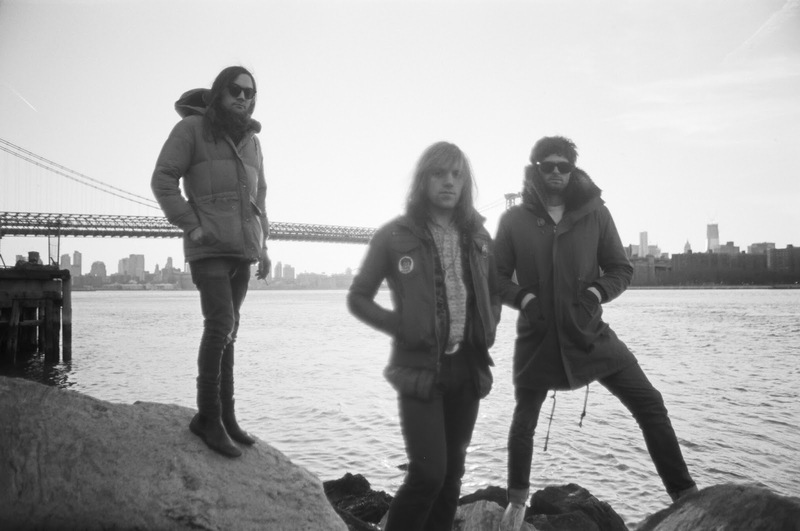 Perhaps because following in the footsteps of rock legends like Tom Petty, Neil Young & Crazy Horse, Bob Dylan, R.E.M., and Wilco is such a daunting and seemingly impossible task, few bands seem willing to even try. Thankfully, Brooklyn-based Country Mice has accepted the challenge and, on their soon to be released second album, Hour of the Wolf, Country Mice has produced remarkable and refreshing American rock, much like Uncle Tupelo during their short but spectacular existence. Recording with talented and experienced producer Doug Boehm at the controls, Country Mice (Jason Rueger (guitar, lead vocals), Ben Bullington (guitar, vocals), Kurt Kuehn (drums), and Mike Feldman (bass)) have produced a record that should make Country Mice known to a much broader audience than indie rockers digging around the internet for hidden gems. There are no soft spots on Hour of the Wolf, but it does have its extra high points. "Feathers" starts things off with Crazy Horse inspired rocker that any self-respecting Neil Young fan would have been happy to hear on any of Neil's recent albums. "Your Black Crow" alternates between a soothing Automatic for the People era verses and a heavy, southern rock guitar laden chorus. "Giving Your Heart Away" (which can be heard here) rivals some of Tom Petty's most elegant and catchy tunes. "What You've Done" is a heavy barroom stomper. "The Wicked" blesses us with another dose of Crazy Horse guitars and riffs accompanied by a seemingly Petty-inspired chorus. Finally, Rueger closes the record with the graceful and beautiful acoustic "Ash." With well written and memorable songs, stellar and sometimes searing guitars, and excellent rhythm section work, Hour of the Wolf is a must-have record for fans of rock and roll in its purest form. Unfortunately, other than the link above, I cannot seem to find much online that can be listened to in advance its release. Thankfully, you can get your own copy of it soon when it is released on February 19. In the meantime, enjoy a few tracks from Country Mice's excellent prior album, Twister. Follow Country Mice on Twitter here and/or on Facebook here. At John Wesley Harding's wildly entertaining "Cabinet of Wonders" show Wednesday night in Portland, the theme was love songs. The Decemberists served as the house band, joined by a variety of singers, including kd lang, Sallie Ford, Laura Veirs, Scott McCaughey and others. The entire show was spectacular, but a major highlight was Colin Meloy and Ben Gibbard (Death Cab for Cutie) sharing the vocals on R.E.M. 's "You Are The Everything" which Meloy introduced as one of his favorites. Peter Buck's mandolin playing gave it an extra dose of authenticity. You Are the Everything from vivian johnson on Vimeo. The show was a benefit for My Music Rx, a terrific organization that brings music to children undergoing serious illnesses. Check them out. R.E.M. 's web page mentioned the event and gave a nice shout out to the WYMA blog - much appreciated! The Stevens have a raw indie rock sound with a melodic core that may remind the listener of Pavement, or Seattle's Young Fresh Fellows. They also serve as a reminder that the pop music scene in Melbourne is among the finest on the globe right now. But back to The Stevens - primary members Alex MacFarlane and Travis MacDonald and their mates released a self-titled EP in 2012 on CD-R and cassette. Since then, the guys have gone big time and signed with Chapter Music. Chapter is releasing the EP on 7" vinyl (with a download code) on April 5, but it is available in digital form on Bandcamp at this very minute. The gang is planning an LP for later this year, and based on what I've heard from the Bandcamp link, I am looking forward to it. However - and maybe I'm just wired this way - I love the sound of the raw EP and, more generally, I love to discover bands at the early stages. If you think like I do, the EP might be a very good choice. In any case, pour a cup of coffee or crack a beer and listen to The Stevens. It will make for a better weekend. 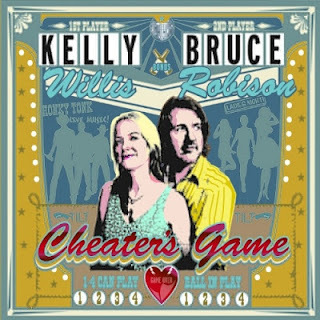 Kelly Willis and Bruce Robison are a couple of super-talented Texans who have each been making some wonderful country music for years, but together, make magic. He is a worthy participant in the grand Texas troubadour tradition with some huge country hits to his credit as a writer, she's a very traditional-sounding country vocalist with a truly great voice. For their latest record, a duet called Cheater's Game, they traveled to Nashville to work with Brad Jones at his Alex The Great studio. Jones' credits include a who's who of singer/songwriters and indie rockers, and this was an inspired pairing. 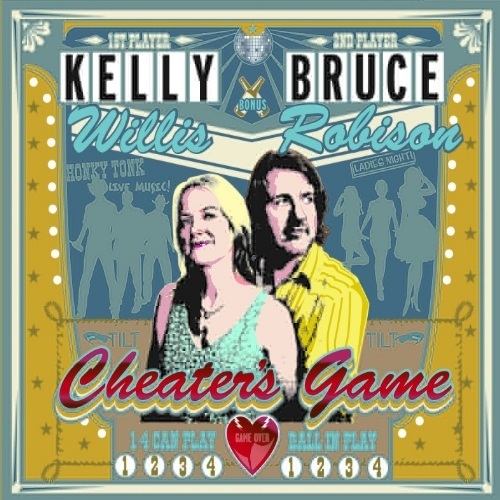 Cheater's Game is an album of about half covers and half originals and it's the first true duet album they've done, although as Willis points out, "We've always been part of each other's records." As for the reason they've not done this before, it's very understandable. Willis again: "But we're also our own people. We've always been very careful about not losing sight of that." All that said, they are even better together than they've been individually. On this record, the whole is truly more than the sum of all its parts. You don't listen for certain things, although certain things (Willis' voice, Robison's great way with a chorus/verse transition, great pedal steel all over this thing) do stand out. But it all flows together so well, if you didn't know who wrote which song, you'd never be able to tell by listening. They cover Dave Alvin, Robert Earl Keen, Don Williams ("We're All The Way" is, maybe, my favorite track on the record), Razzy Bayley and Hayes Carll. And Robison co-wrote songs with Miles Zuniga (Fastball) and Lawrence Shoberg -and, as expected, Robison's songs stand up very well next to the songs they borrowed from these country songwriting giants. Here's a nice article from their hometown Austin American-Statesman giving some background on the making of the record. And I agree with the author, this is a great, truly timeless-sounding country record. Cheater's Game is available now (released earlier this week) via Thirty Tigers, and they'll be on tour soon - tour dates at their website here. 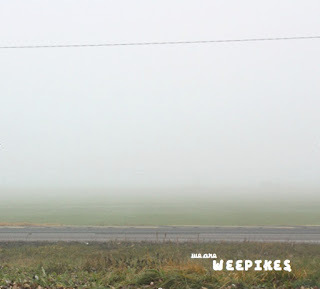 Weepikes - back with some more Finnish Pronk! Last April, we heard from Finland's prog/punk Weepikes - they had resurrected their band after a 16 year hiatus - and we happily shared the music with our readers. WYMA post here. They've got some new music - it can be heard, bought and downloaded at their Bandcamp site. Lo-fi vocals, heavy rhythm section, with insistent guitars throughout - I'll say it again, this is manna to a fan of the Pixies, GbV and the like. We enjoy a large number of submissions from which to choose when deciding what to cover on When You Motor Away. But since four of the six of us have law degrees, we are inclined to give a special look when one of our fellow lawyers is on the business side of the microphone. And if she jumps the line a bit, chalk it up to professional courtesy. Since I'm the Seattle lawyer, I win the right to cover Green Light Go, the new album from Seattle's The Redwood Plan. Lesli Wood is a known and respected figure in the Puget Sound rock world. Her latest venture album takes her riot girl stylings and punk roots and marries them into the rhythms of the dance floor. The result is a bracing set of dance punk songs that will have you dancing the night away. As an "off label" suggestion, it also happens to be freakishly good driving music. None of the foregoing is intended to suggest that Green Light Go doesn't have diversity. For example, "Slam" has evident punk roots, while "The Scenery & Melody" is an excellent pop song. "Rattle" was born and bred on the dance floor. The punk roots of "Slam" are evident. "Slam", "The Scenery & Melody" and the lead track, "Panic On", can be asked for a dance below. You can stream (and buy) the entire album from Bandcamp. The Redwood Plan are Lesli Wood (vocals/keyboard/guitar), Sydney Stolfus (guitar), Betty ST (drums), and Larry Brady (bass/vocals). 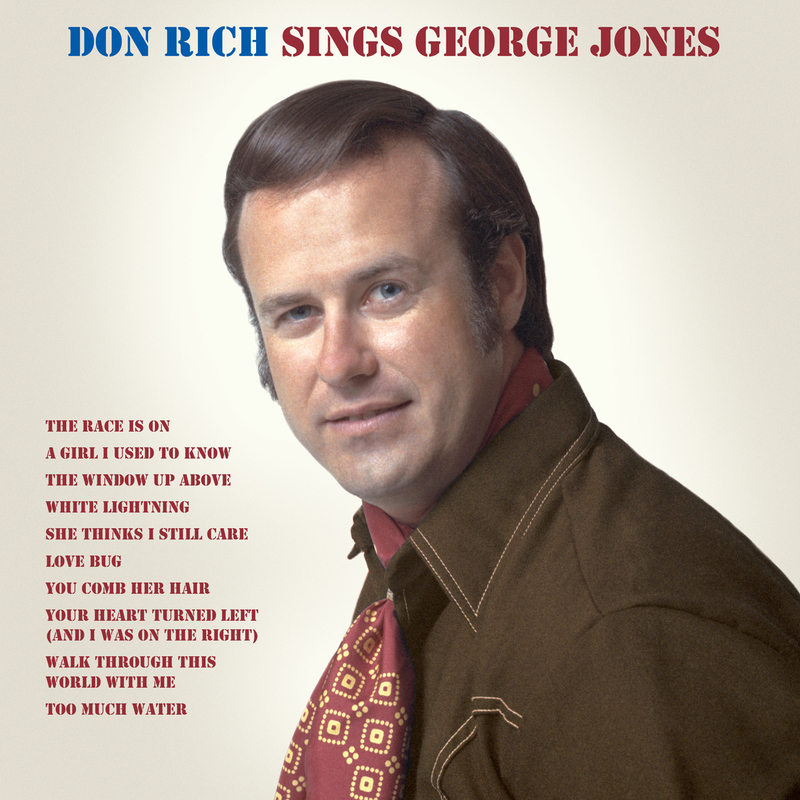 It's been a delight to delve into some of these country reissues from Omnivore Recordings, and this Don Rich record of George Jones covers is no exception. It sounds great, and it is apparently the only solo album Rich ever did. Unlike the recent Buck Owens reissue disc we covered, which was never recorded as an album, this was meant to be released. It was the result of an approach Owens made to Rich: "Hey, why don't you do an album of George Jones covers?" The Buckaroos had been doing records with various members on vocals, so this was not much of a stretch and the results are terrific. Unfortunately, it was shelved soon after being recorded in 1970 and never released until now... but better, much better, late than never. If you like country music at all, you're going to want to check this out. It may be the best pure country record I've heard so far this year. It's got the Nashville imprimatur of the great George Jones, but it is done in the Bakersfield style made so popular by Don Rich and Buck Owens (who also helps on the record, and has four of his own Jones covers thrown in for good measure). The band is the 1970 edition of the Buckaroos. You can read a little more about the history of the recordings, and order the record from Omnivore, here. This week's Friday Nugget is one of the signature songs of the era. The Blues Magoos were from the Bronx in New York City and had some minor hits, but a worldwide smash with "(We Ain't Got) Nothin' Yet" released as a single in 1967. I especially love the Vox Continental organ sound and the crazy guitar runs. New York-based shoegaze act Dead Leaf Echo has a new album Thought And Language, which I really like (WYMA Review here). Mar 12 to Mar 17 - SXSW Austin TX. Pre-order and buy some of their other music at Neon Sigh. Stubborn Heart is an electro-soul band from the UK consisting of Luca Santucci and Ben Fitzgerald. Their debut album is out now on the One Little Indian Records. To introduce you to their music, they have released this Valentines Lovetape. You can stream it below and download it for free. It sounds to me like a tasteful update of Northern Soul, I think it is good stuff. Removing some of the loudness and highlighting the violin was the goal, and they went into the studio with Karl Blau to achieve it. While I did enjoy the more "rock" sound of their previous music, I will say that on this song, they've achieved the goal of highlighting her violin and his voice - and their approach makes a lot of sense. I'd compare it to the approach employed by Gillian Welch and David Rawlings - with acoustic instrumentation and vocals, because of the way their songs are built, they're able to embody a sound that, while spare and using space well, is extremely full. Looking forward to hearing the rest of the new record. Ghetto Moon will be out March 19 on Bee Resin Records. Glasgow guitar pop band Bubblegum Lemonade released Hits in the Car in 2012, a fine album that made my top fifty albums. To help you adjust your attitude to match this romantic holiday, the band has shared this musical Valentine. I understand that it might appear on their next LP which is planned for later this year. 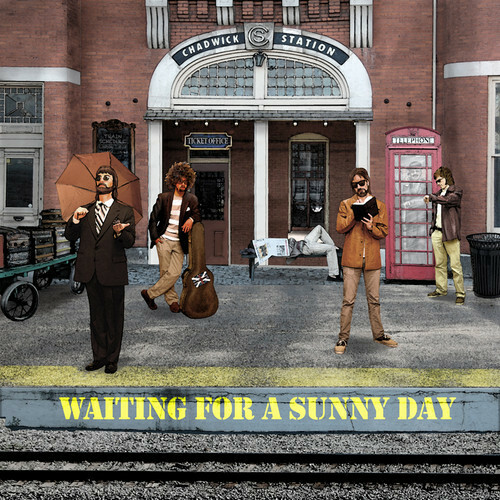 From Britain by way of Nashville, TN comes Chadwick Station... though you'd certainly be able to guess the former from the sound of Waiting For A Sunny Day, their debut 5-song EP. Lead vocalist Alvis Kensington's got a Paul/Ringo thing going on the vocals - in fact, his mannered style reminds me, in places, of Ian Anderson. The band relocated from Great Britain to Nashville to work with pop/rock veteran Bill Cuomo. This is not lo-fi indie rock or dream pop, this is radio-friendly Beatles-influenced (by way of 70's radio) pop music. I'd say if Abbey Road was your favorite Beatles album, and you yearn for simple, sunny pop music that can take you back to that place and time, this may be right up your alley. It's out now on Englishwood Records, and you can learn more at the Chadwick Station Website. Over the course of the 12 songs that compose Prose And Kahns, Old English (Canadian artist Matt Henderson) weaves together elements of several strains of modern indie rock. There's dance rock (check out the beats in "We've Been Here Before"). There's introspective, moody electronic stuff (as in the soulful vocals, slowed-down pace and synths throughout "The Corrections"). There's straight-ahead singer/songwriter folk rock ("Pop Shop", at least until it soars off toward shoegaze territory in the last minute or so). And there's plenty of guitar - in front of and behind the beats, synths and understated vocals. The best part is, Henderson pulls all this together to make the album a journey worth taking. Prose And Kahns was released last week (Feb. 5). You can learn more at the Old English website, or the Old English page at the CBC. 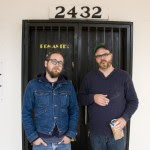 Water Liars is Andrew Bryant and Justin Kinkel-Schuster. Their second album, Wyoming, will be out March 5 on Fat Possum/Big Legal Mess - read more, and pre-order from Fat Possum, at this link. We previously featured another advance track from the album, "Fake Heat" - click here to check it out. New Electronic Rock Discovery: Patti Yang - "I Am Ready"
This will be part of an EP with a couple of remixes (Jagz Kooner and Skylab), then an album later in the year. I really like the way this nearly six-minute track builds and unfolds, and look forward to hearing more from her. We introduced our readers to the great sound of Finnish rock band French Films last fall (link). They play an infectious brand of New Order post punk/Close Lobster college rock that we find very appealing. French Films' next album, White Orchid will be released later this spring on the GAEA label in Scandinavia and Odyssey Music Network and Rough Trade elsewhere in Europe. While waiting for that release, new and old fans can enjoy a delightful anthem from the record -- "Latter Days". Give it a spin below and put White Orchid on your wish list. Henry Rollins is 52 today. His post-punk incendiary rock was a great 80's and 90's counterpoint to the self-absorbed and introspective rock of that era. I always looked forward to the in-concert energy of the Rollins Band and fellow political rock gadflies Rage Against the Machine. Rollins always seemed like a prime candidate for on-stage spontaneous combustion. The other day someone asked if they would ever see Ted Nugent on WYMA. Good question. I had a couple of apocryphal experiences at Nugent concerts in the Rust Belt Midwest which in retrospect seem to be scripted by Fellini and Bosch. I may share them at a future time. Instead, I leave you with a clip from an anti-Nugent rocking harder than Ted ever has. Give it a listen and pull-start your rock and roll motor. West Palm Beach, Florida's Surfer Blood will be releasing a new LP Pythons in June. As an appetizer, they have released "Weird Shapes". 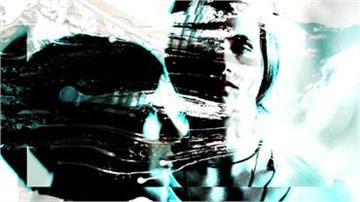 While the guitar-centric aspect of their earlier work remains, this track bears fewer guitar effects and suggests a more straightforward rock approach. I think I'm going to like it. We wrote about them back in November and twice previously, and while they wouldn't have to offer free music to get me to write about them again, it's a decent excuse. The Pharmacy's Stoned And Alone, which also made my 2012 Top 50, is available via Old Flame Records. Quick Update: Kurt Vile "Wakin on a Pretty Daze"
WYMA favorite Kurt Vile is releasing a double record called Wakin on a Pretty Daze on April 9. Now that is something to look forward to. We are certainly ready for a great deal more of stuff this good. Vile's vocals and psychedelic acoustic guitar sound are so distinctive and always just right. Matador Records announced information about the record here, including tour dates, track listing and a video about the cover art. We'll review this one for sure as the release date arrives. One more reason to look forward to Spring. Some things are special because the things themselves are good; some things are special because the timing is good. And some things are both good and well timed. I suppose that if we investigated, we'd find that none of Southern California's The Little Ones are doctors, or even licensed pharmacists. However, their new eleven-track LP, The Dawn Sang Along, may be the best, least expensive, and perfectly timed cure for the mid-winter blahs that you will find this year. 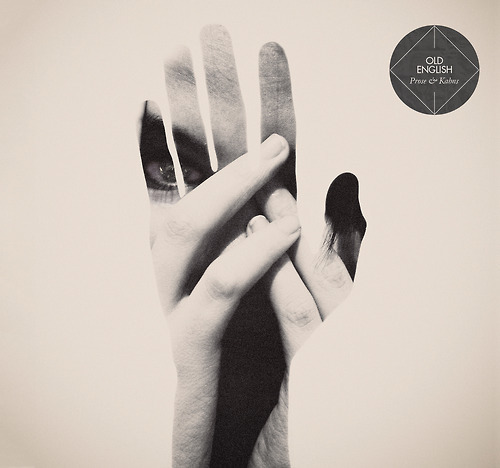 The album is indie pop -- indie pop drawn with broad strokes. Accordingly, rather than appealing to some pop lovers of some sub-genre, but leaving others cold, if you are a pop fan you will appreciate this album. The tones are sharp and bright, the chords major, and the harmonies buoyant and warm. And a number of flourishes and rhythms have an international feel to them. This is a good thing because it gives the listener the impression that the sunny mood and good times can follow the weather around the globe. "Forro" and "Argonauts" are the two songs available to include here, but most any song from the album would have sufficed. One of my personal favorites is "Catch the Movement", which is one of my favorites songs of the year to date. The Little Ones are Lee LaDouceur, Kevin Lenhart, Ian Moreno, Brian Reyes, Ed Reyes and Ryan Wilson. They are based in Los Angeles and San Diego. The Dawn Sang Along is out on February 12 on the Branches Recording Collective label. Always a sucker for bittersweet songs in 3/4 time, I was immediately hooked on "Duet for Emmylou and the Grievous Angel" and impressed with its simple and beautiful Neil Youngish elegance (hint: Neil Young is God). Regardless of the general style of song (ranging from alt-country to Arcade Fire-esque modern indie rock), Rah Rah keeps churning out catchy tunes that stick with you long after the first listening. Their most recent and third full length release,The Poet's Dead, was one of the hidden gems of 2012. Check out the addictive "Art and a Wife" and "Prairie Girl" below. Then, go see them when they come to your town (like at the Smiling Moose (Upstairs) in Pittsburgh) and at SXSW. I don't think I'm going out on a limb to say that IT GIRL likes guitars. And on their debut EP, Neon Signs, guitars are delivered with angular, post punk, dance rock energy and a hint of menace. With the additional element of baritone vocals, the band might remind listeners of fellow Glaswegians Franz Ferdinand or Interpol -- more the former than the latter for my ears, and that'e a good thing. But IT GIRL has less of Franz Ferdinand's louche moments and more urgency and pace. The songs have a palpable forward drive, with the upfront bass and percussion supporting crunchy chords and a stabbing, commanding lead guitar. The vocals are up in the mix, but have a understated texture that leaves the guitars center stage. You can stream the entire album below. The title track initiates proceedings with energy and swagger. "Hailey Commits" has a late-night anxious feel, while "Firelight" is probably comes the closest to being a pop song. One notable aspect of the album is that the drumming, which is uniformly excellent, is provided by five different drummers. If, like me, you like what you hear, the album is available for "name your price" at the Bandcamp link below. Here Comes the Here Comes is a Castle Face Records supergroup consisting of Mark Tester (Burnt Ones), Adam Finken (Blasted Canyons) and Brigid Dawson (Thee Oh Sees) that came together as Castle Face was putting together a covers album in tribute to the Velvet Underground & Nico (our coverage of the album here). The producer for "I'll Be Your Mirror" decided to have the lyrics read by 13-year old Cisca Hughes. Here is the song and video. Mar 14 Brisbane, AU – Hi-Fi w/ Dinosaur Jr.
Mar 15 Coolangatta, AU – Coolangatta Hotel w/ Dinosaur Jr.
Don Wilson, an original guitarist in The Ventures, is 80 today. The impact of The Ventures on guitar based rock is arguably the equal of any other RnR group. 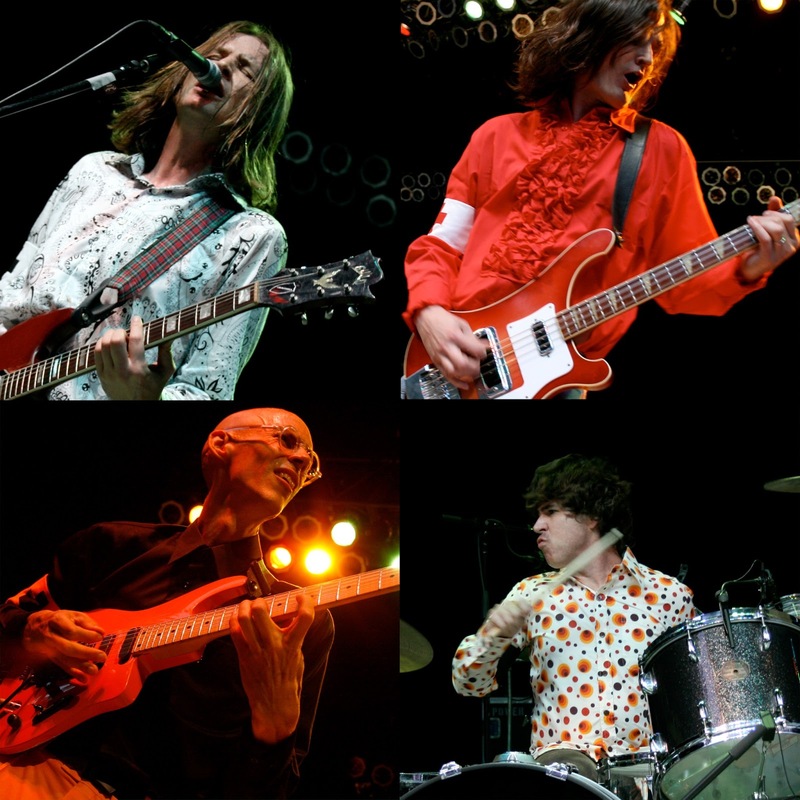 The number of musicians naming them as major influences is impressive: George Harrison, Lindsey Buckingham Ray Davies, Terry Kath, Mark Knopfler, The Ramones, Keith Moon, Stevie Ray, Vaughan, Jimmy Page, Brian May, and Ted Nugent. They provided the impetus for many to start their own bands. The first question asked of any aspiring 60's drummer was "Can you play Wipe Out?" The some tonal quality and sound can be heard in the music of many current cutting edge groups. Gemma, Louise and Sophie, three women from the UK's Derbyshire Dales, form Haiku Salut. Their music really is its own genre - experimental, baroque, instrumental music with folk and electronic elements. Instruments include, but probably are not limited to, loop pedals, accordions, and melodicas. Their album Tricolore will be out in March on London's How Does It Feel To Be Loved label. The single "Los Elefantes" was released in January, and is available as a free download here below. It is a gorgeous song and I look forward to the album. Haiku Salut - Los Elefantes from Haiku Salut on Vimeo. Here they were, right under my nose in Portland OR where I live, though I hadn't heard of Paradise until our leader here at WYMA, John Hyland, alerted me. They prominently use a farfisa organ, a vastly underrated rock'n'roll instrument. Said farfisa organ is played by a very stylish female named Tamar Paradise. We like this a great deal. They are a fashion-forward bunch, and their videos, graphic design and even their fans look terrific. We think this is good - we are tired of sloppy-looking, unfit guys in old flannel shirts. They all use the last name Paradise, which is not all they have in common with The Ramones: Steve Paradise (lead vocals and guitars, and really great guitar at that), Dominic Paradise (bass - heavy/aggressive; vocals), Brian Paradise (drums, tears it up), Tamar Paradise (farfisa, vocals). However, and this is very important, don't let the names, sharp clothes, and high concept accoutrements fool you - Paradise absolutely rock. And not in a careful, high fashion way - they rock like Iggy Pop rocks, with abandon, and a gritty, rough and tumble, garage punk sound. While he might not look like it, Steve Paradise is a badass. So is Dominic Paradise, though he looks the part too. One or more of them originally hail from Cleveland. That makes for very good rock genes. Ian Hunter was right. Their debut LP Diary of An Old Soul is a stunningly perfect 8 song, 30 minute, Nuggets-inspired joyride of psychedelic / garage rock / punk rock heaven. That point at the 1:17 mark when they throw it into high gear is one of my favorite musical moments in quite awhile. While the Nuggets influences are prevalent, this record is hardly a strict '60's throw back, and owes just as much to punk and post-punk bands like The Ramones and Nirvana, and more than anything, Paradise's own, bold, 2013-sounding take on the last 40 years of rock'n'roll. What I like best about Diary of An Old Soul is how much of a true and defined sound it has start to finish - Paradise has an unusually clear sense of what they are trying to accomplish sonically. Actually the band this reminds me most of is a similarly farfisa-heavy 80's band out of Boston, The Lyres (note to Paradise: you should work up a cover of "Help You Ann" for your live shows). This is great stuff and my favorite find of the new year.